More efficient organization for alphabetical, chronological or numerical sorting. 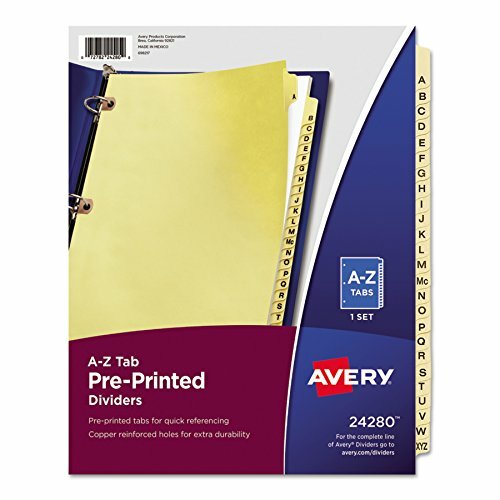 The process becomes simple with handy preprinted tabs to help you get started organizing your paperwork instantly. 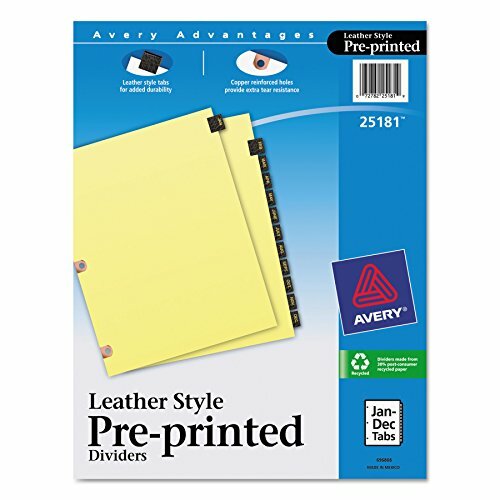 Prepunched holes in each divider are reinforced with durable copper, so you can turn pages secure in the knowledge that your dividers won't tear easily from the binder rings. Easy-to-read black lettering helps you find the right section at a glance. Tab Style: 25-Tab; Tab Color(s): Buff; Index Divider Size: 11 x 8 1/2; Form Quantity: 1. More efficient organization for alphabetical, chronological, or numerical sorting. Durable black leather combines with gold numbering for a classic and elegant look. The prepunched holes are reinforced with copper for dividers that stay securely bound in your three-ring binder without tearing on the rings. With these durable dividers, your paperwork is organized every day. Tab Style: 31-Tab; Tab Color(s): Black; Index Divider Size: 11 x 8 1/2; Form Quantity: 1. More efficient organization for alphabetical, chronological or numerical sorting. The process becomes simple with handy preprinted tabs to help you get started organizing your paperwork instantly. 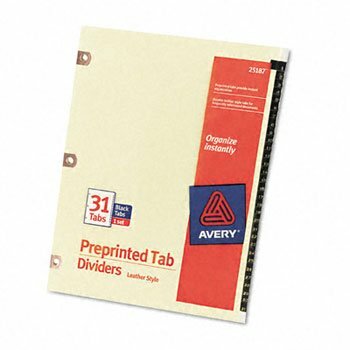 Prepunched holes in each divider are reinforced with durable copper, so you can turn pages secure in the knowledge that your dividers won't tear easily from the binder rings. Easy-to-read black lettering helps you find the right section at a glance. Tab Style: 12-Tab; Tab Color(s): Buff; Index Divider Size: 11 x 8 1/2; Form Quantity: 1. Copper reinforced holes provide extra tear resistance. 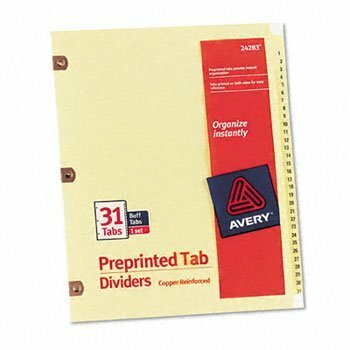 Laminated tabs feature bold black printing on front and back. Rip-Proof? reinforced tabs will not bend, even after heavy use. High-quality paper is three-hole punched. Tab Style: 31-Tab; Tab Color(s): Buff; Index Divider Size: 11 x 8 1/2; Form Quantity: 1. Get yourself organized all month long. The process becomes simple with Copper Reinforced Preprinted Dividers. The handy preprinted tabs cover the calendar days of each month to help you get started organizing your paperwork instantly. 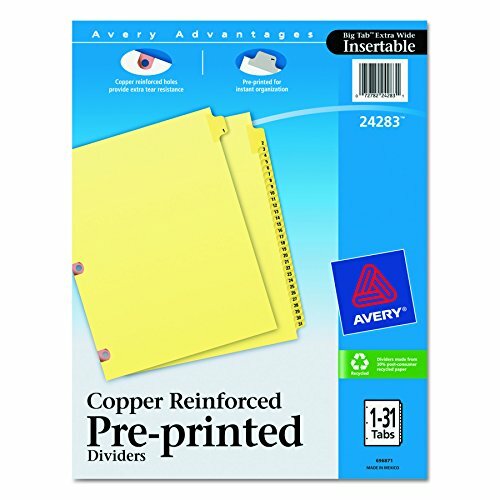 Prepunched holes in each divider are reinforced with durable copper, so you can turn pages secure in the knowledge that your dividers won't tear easily on the binder's rings. Easy-to-read black lettering helps you find the right section at a glance for an organizational solution that's always in working order. Rip ProofTM reinforced tabs feature bold black printing on front and back. Three-hole punched for use in standard ring binders. Copper reinforced holes for added strength to resist tearing. Rip ProofTM reinforced tabs feature bold black printing on front and back. Three-hole punched for use in standard ring binders. Copper reinforced holes for added strength to resist tearing. Global Product Type: Index Dividers-Preprinted; Index Divider Size: 11 x 8 1/2; Tab Title(s): 1-31; Tab Color(s): Buff. Gold color printing on front and back of tabs. Copper reinforced holes for added strength. Three-hole punched for use in standard binders. Gold color printing on front and back of tabs. Copper reinforced holes for added strength. Three-hole punched for use in standard binders. Global Product Type: Index Dividers-Preprinted; Index Divider Size: 11 x 8 1/2; Tab Title(s): 1-31; Tab Color(s): Black. 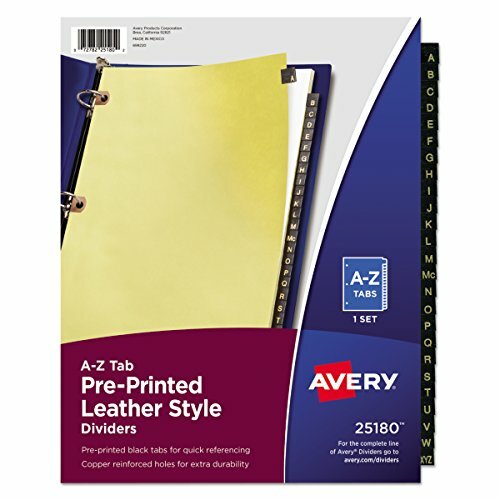 Avery Preprinted Black Leather Tab Dividers w/Copper Reinforced Holes, 12-Tab, Letter More efficient organization for alphabetical, chronological, or numerical sorting. Durable black leather combines with gold numbering for a classic and elegant look. The prepunched holes are reinforced with copper for dividers that stay securely bound in your three-ring binder without tearing on the rings. 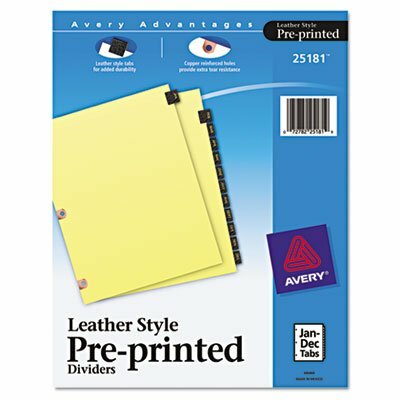 With these durable dividers, your paperwork is organized every day. Tab Style: 12-Tab; Tab Color(s): Black; Index Divider Size: 11 x 8 1/2; Form Quantity: 1. Quality buff paper is three-hole punched. 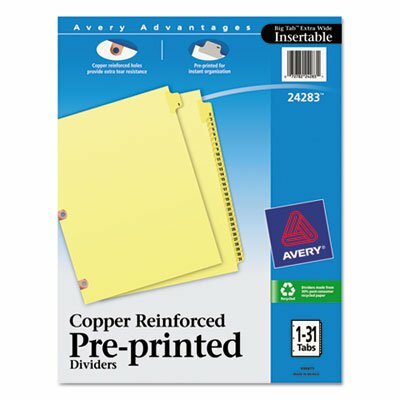 Looking for more Avery Copper Reinforced Preprinted Tab similar ideas? Try to explore these searches: Plastic Adhesive Hooks, Crazy Penguins, and Disco Necklace Costume. Shopwion.com is the smartest way for comparison shopping: compare prices from most trusted leading online stores for best Avery Copper Reinforced Preprinted Tab, Sanford Guide, Maglite Switch, Copper Reinforced Preprinted Avery Tab . 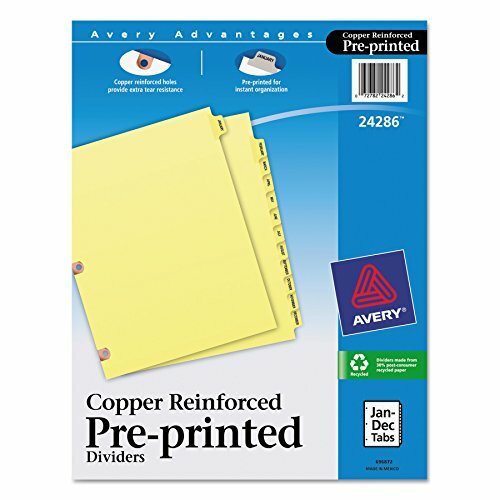 Don't miss this Avery Copper Reinforced Preprinted Tab today, April 26, 2019 deals, updated daily.